The Hotel Barceló Aran Mantegna is an icon of luxury and comfort which can be recognised at distance from its exteriors, made of glass, steel and marble. 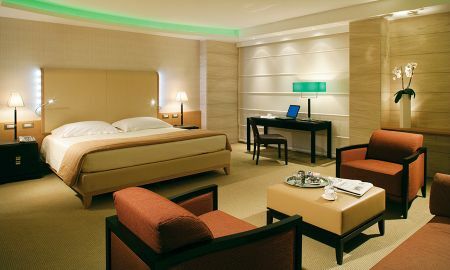 Its elegance is also reflected in the interiors bringing a touch of light to the hotel spaces and rooms. 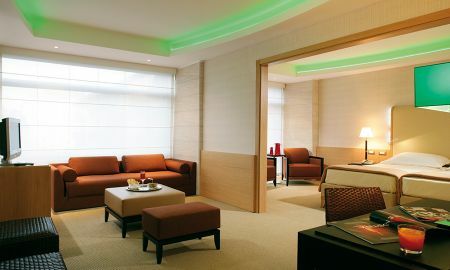 Equipped with free Wi-Fi connection, the rooms are spacious and have all necessary amenities for business travellers or families. "La Brasserie" restaurant offers guests à la carte menus based on Mediterranean and Italian specialities. The Hotel Barceló Aran Mantegna boasts a large conference and convention centre split in two floors that can be reached by panoramic elevators. It may welcome up to 1,000 visitors and it is the ideal place for seminars, private or corporate events. The Barceló Aran Mantegna rises in Via Cristoforo Colombo in a residential area located in the south of Rome. Rome's downtown, the financial district, the EUR exhibition centre, Fiumicinio and Ciampino Airports can be reached by car in few minutes.